House Speaker Tim Armstead gavels in the start of the 2018 Legislative session Wednesday afternoon at the WV Capitol. 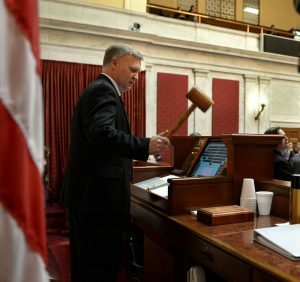 CHARLESTON, W.Va. — A Republican delegate from the Eastern Panhandle attempted to oust the Speaker of the House of Delegates from the House floor Wednesday, the first day of the 2018 legislative session. Delegate S. Marshall Wilson, R-Berkeley, made a motion to vacate the position currently held by Delegate Tim Armstead, R-Kanawha. In an interview, Wilson said he did so because Armstead has made a pattern of stifling debate within the caucus, which quiets the voices of the voters who elected him. Wilson’s motion did not receive a second, and Delegate Daryl Cowles, R-Morgan, tabled it. Within hours of Wilson making the motion, Armstead removed him from both the Veterans Affairs and Homeland Security Committee and the Small Business and Economic Development Committee. Wilson still sits on the House Education Committee, his only remaining committee assignment.